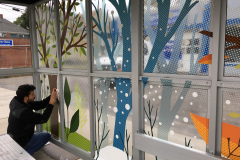 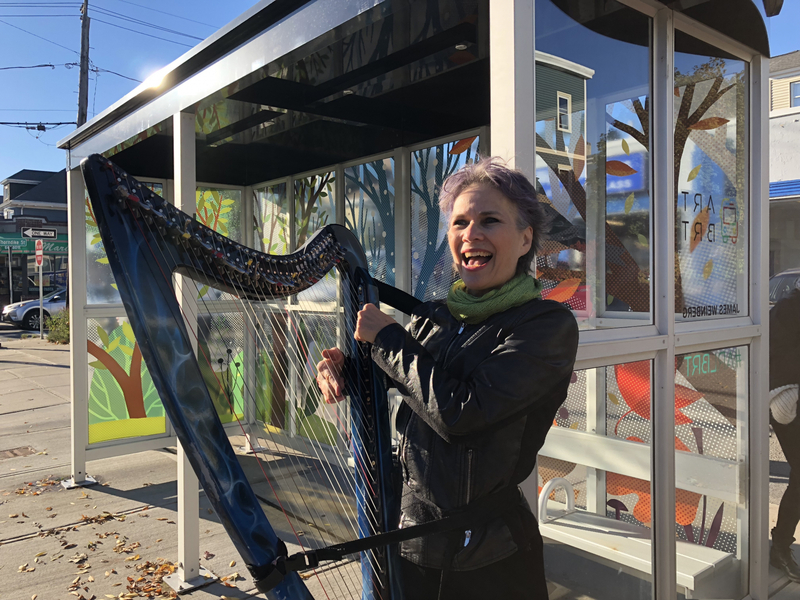 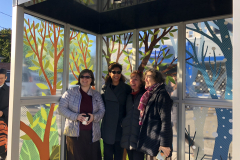 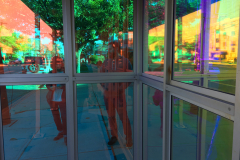 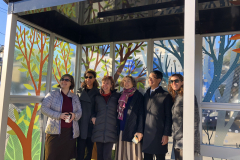 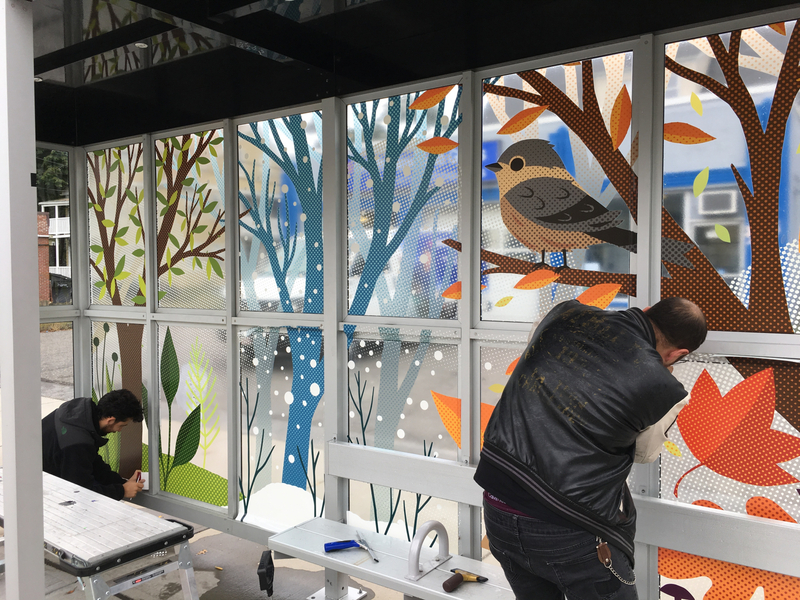 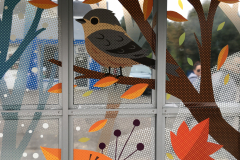 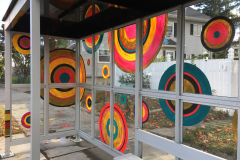 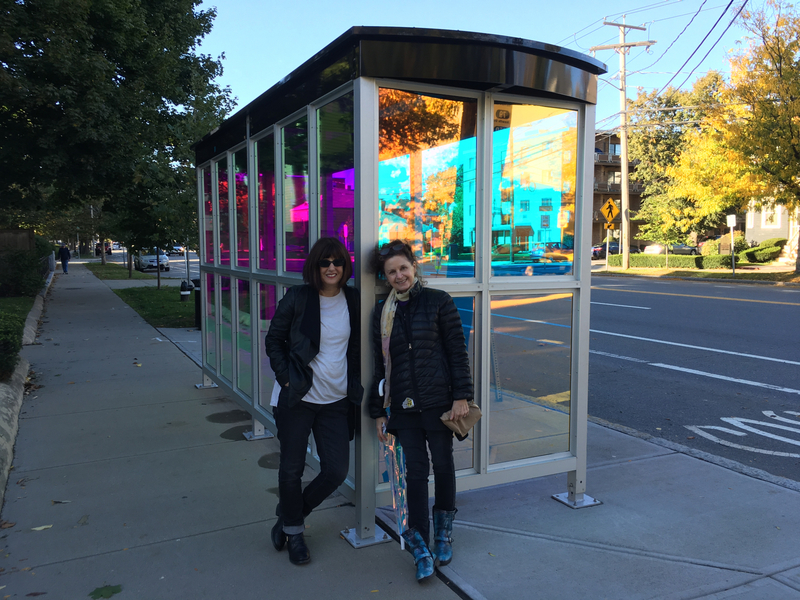 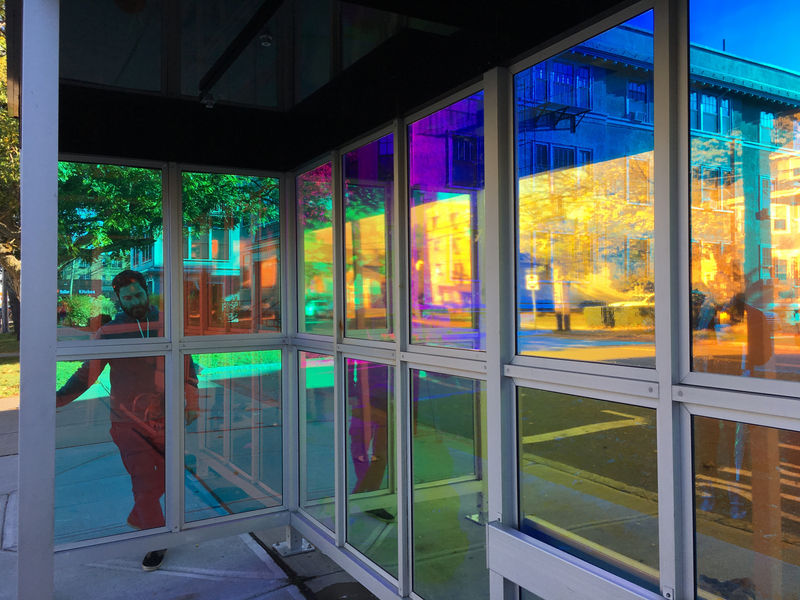 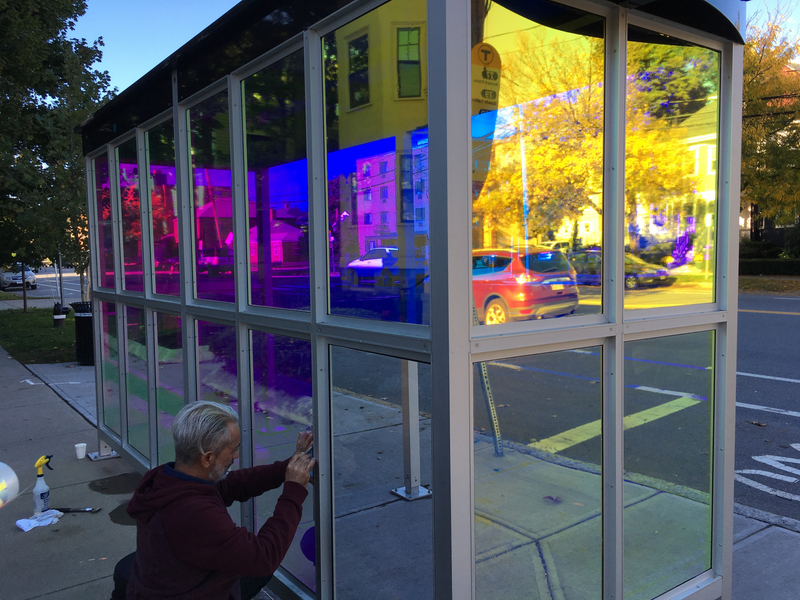 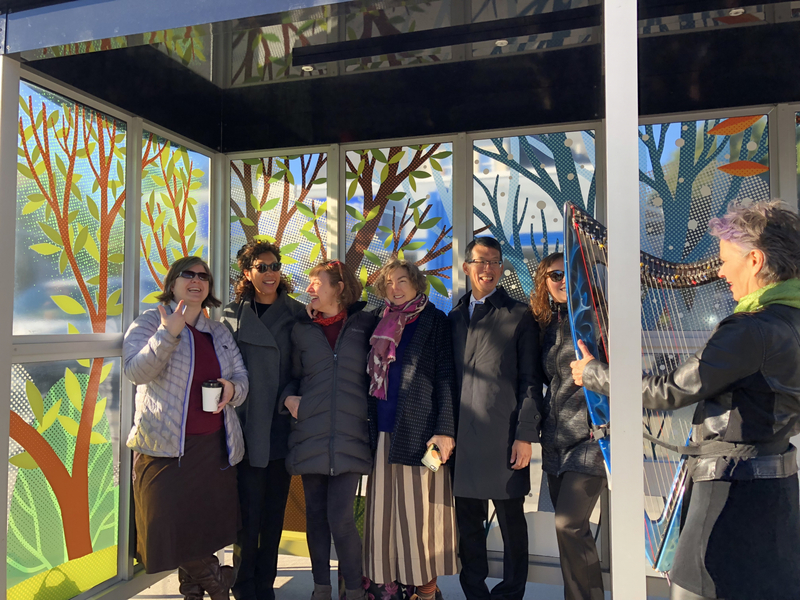 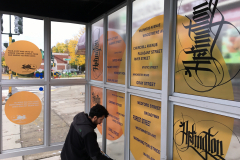 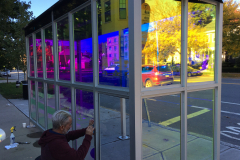 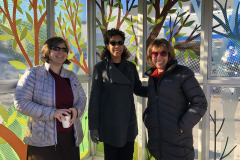 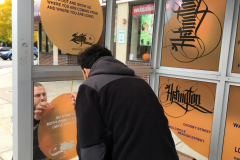 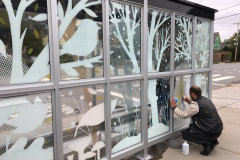 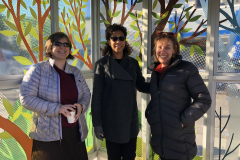 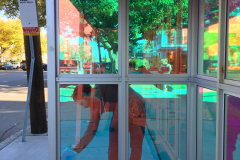 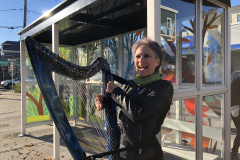 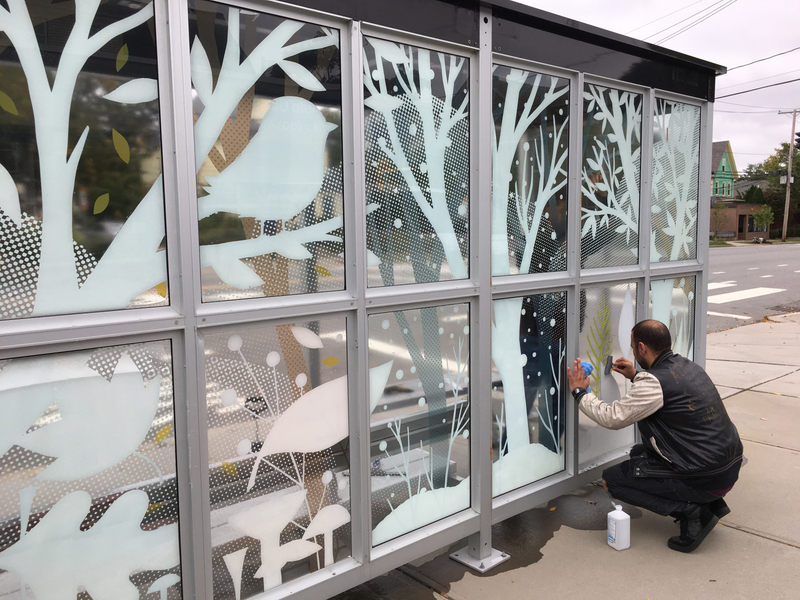 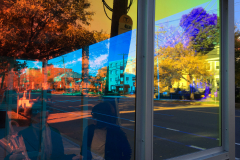 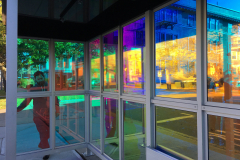 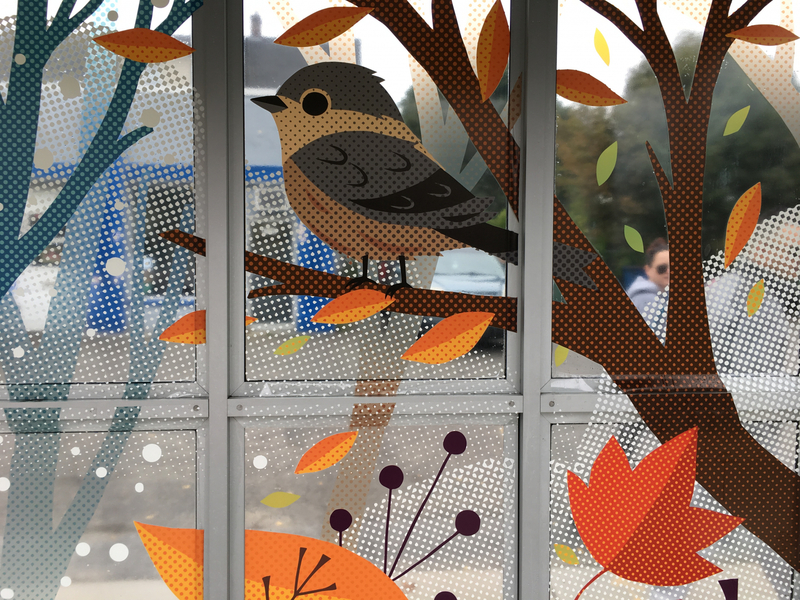 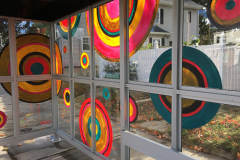 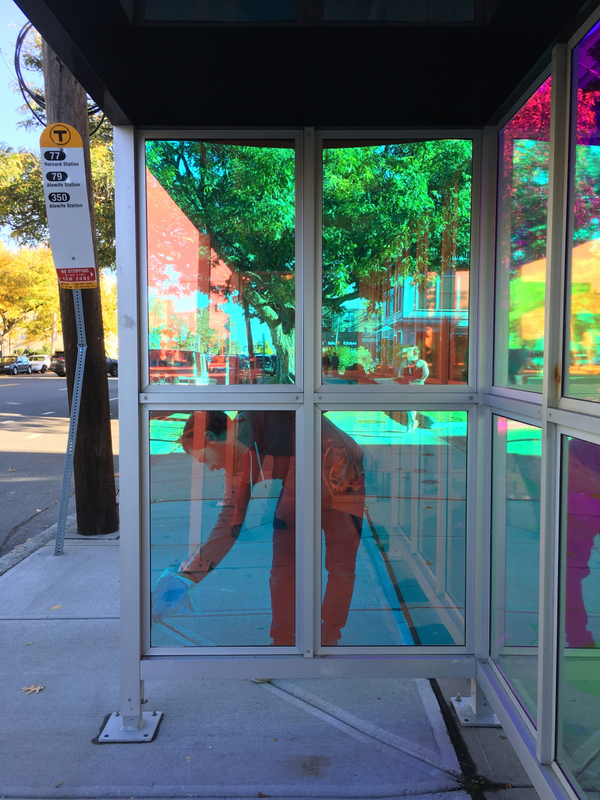 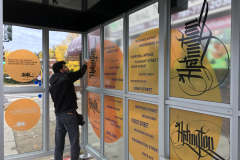 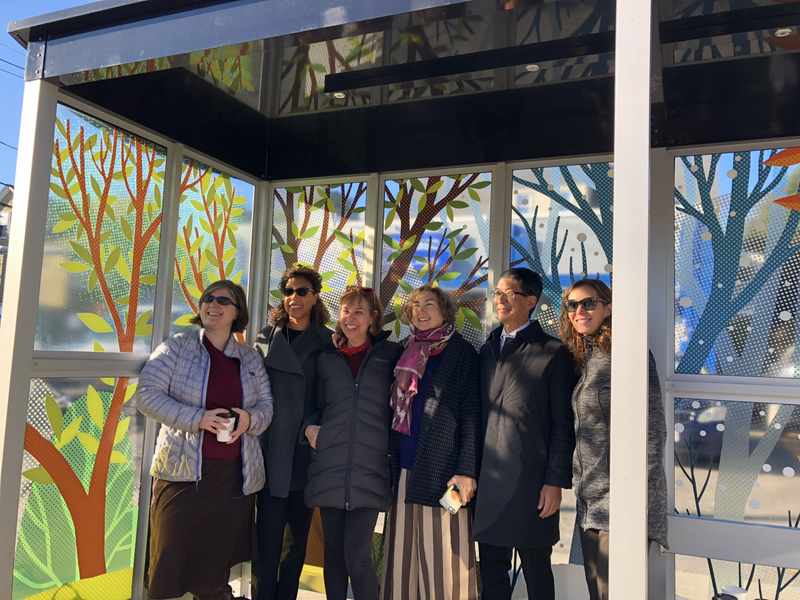 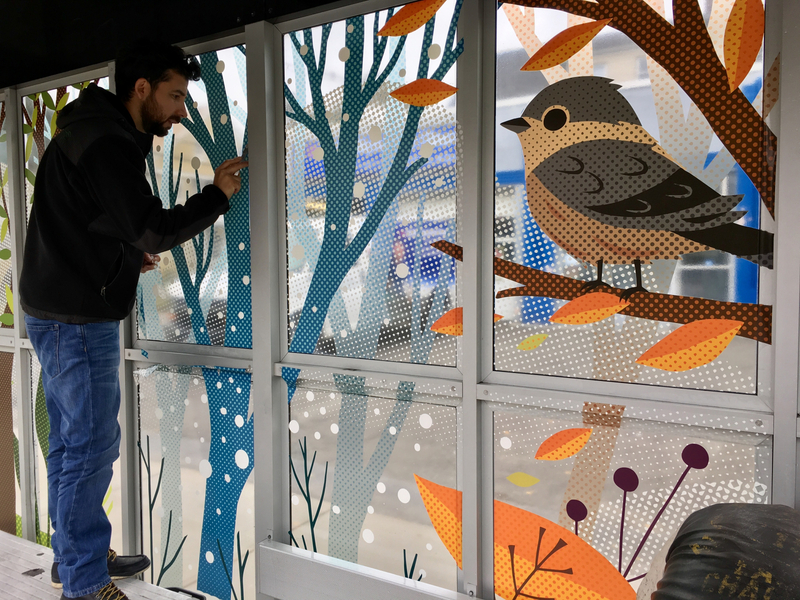 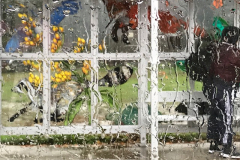 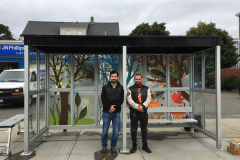 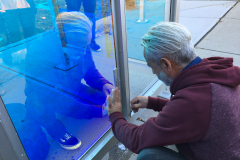 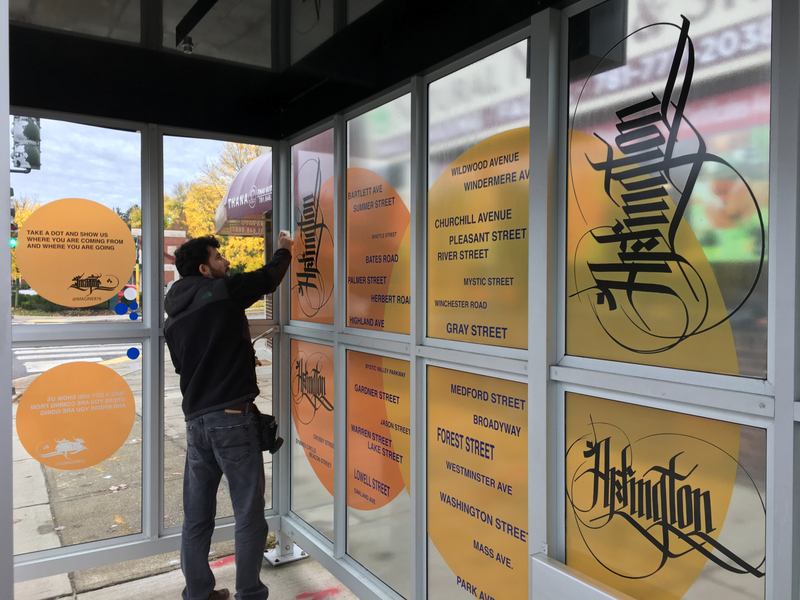 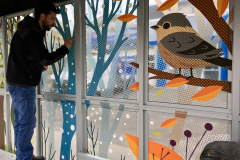 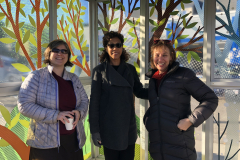 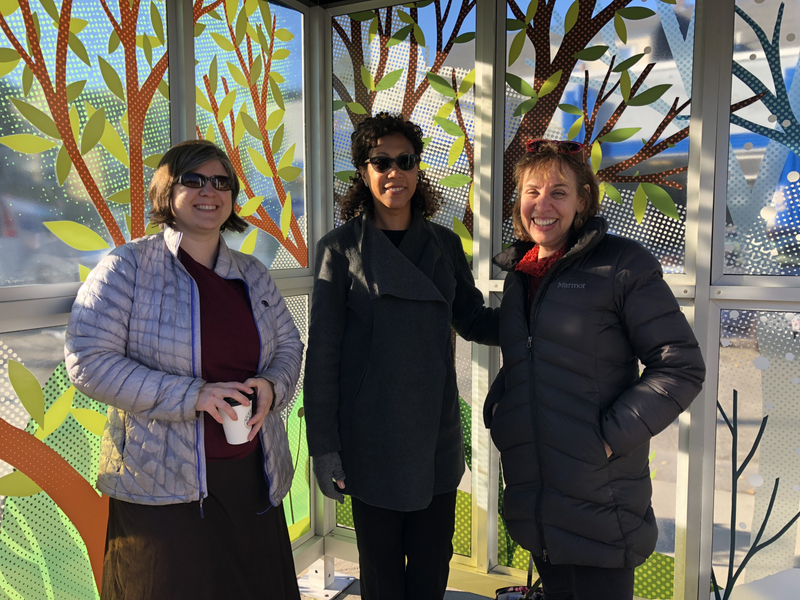 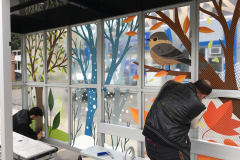 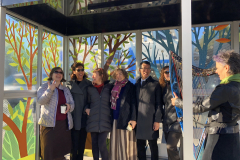 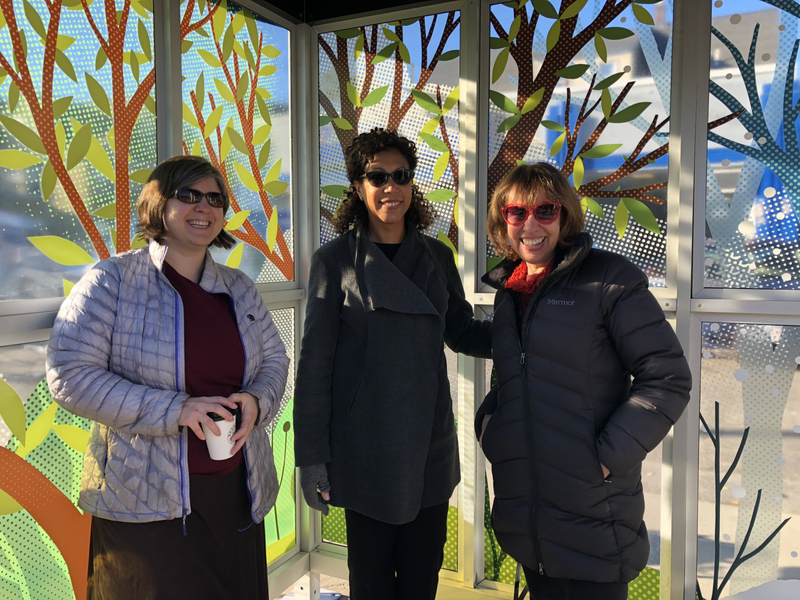 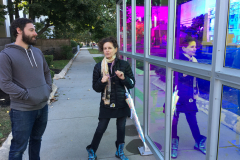 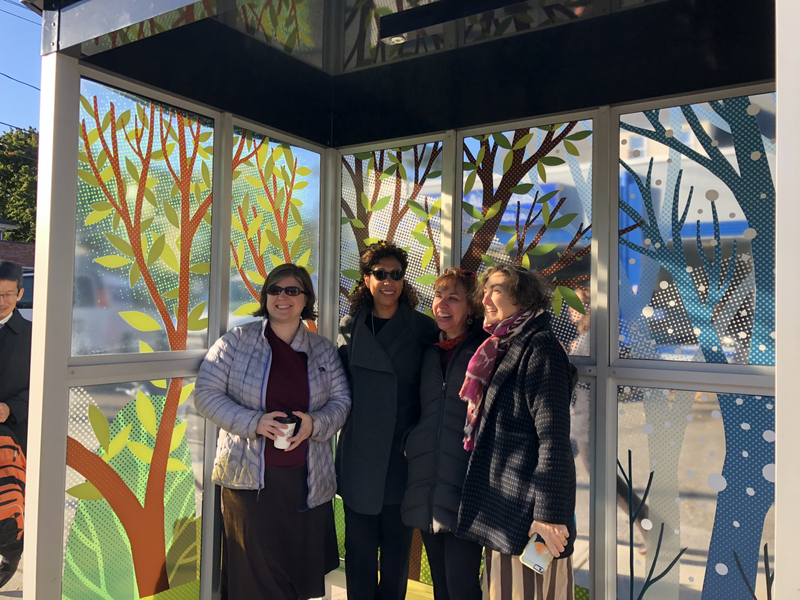 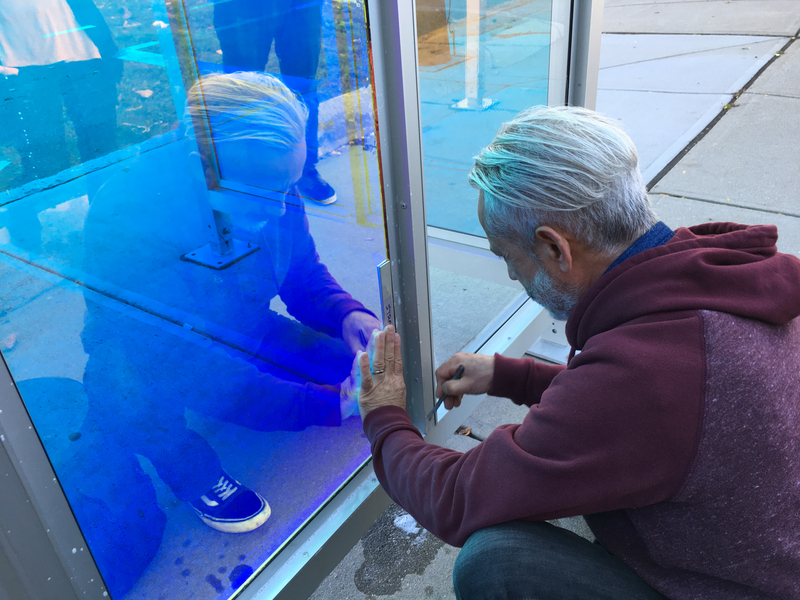 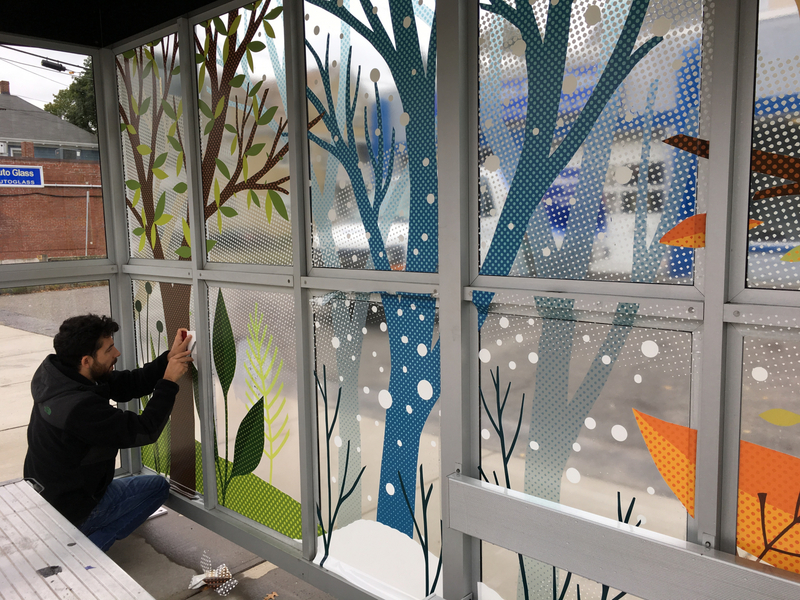 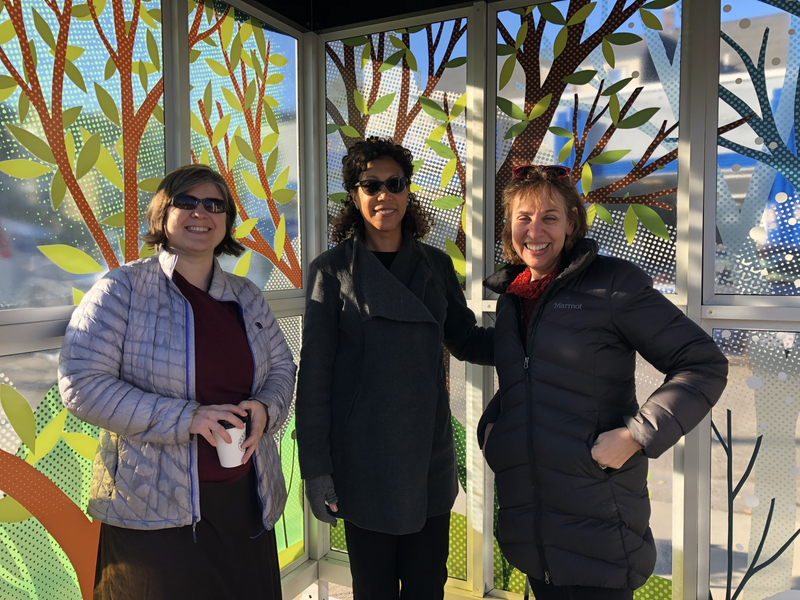 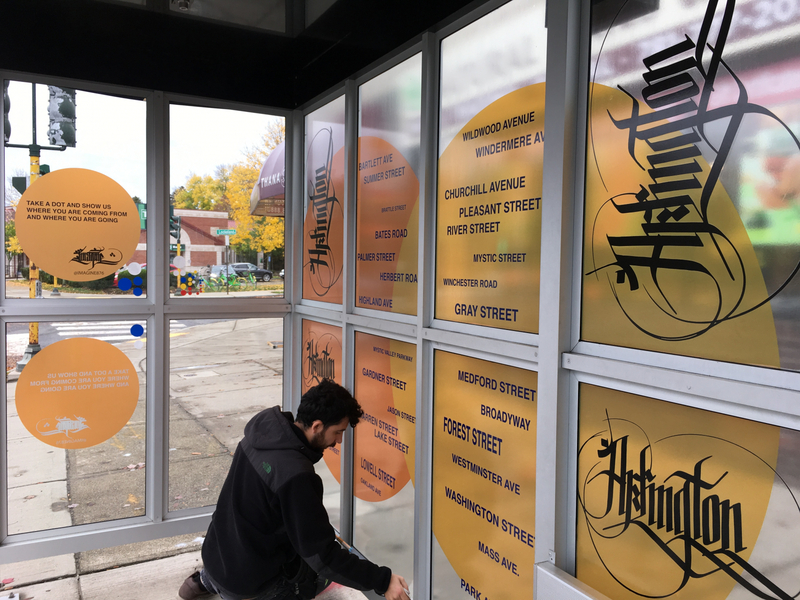 Arlington Public Art has enlisted five artists to transform five bus shelters into works of art. 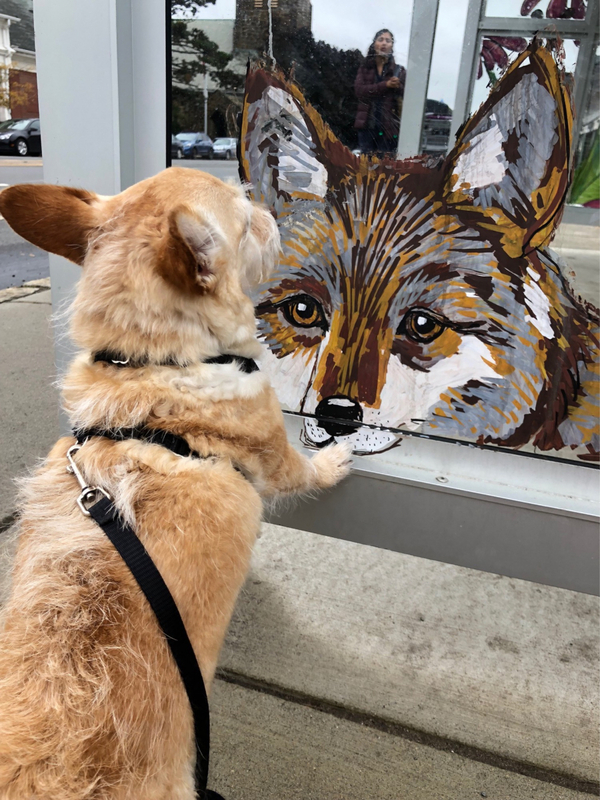 Each one is unique, reflecting the style and interests of each artist. 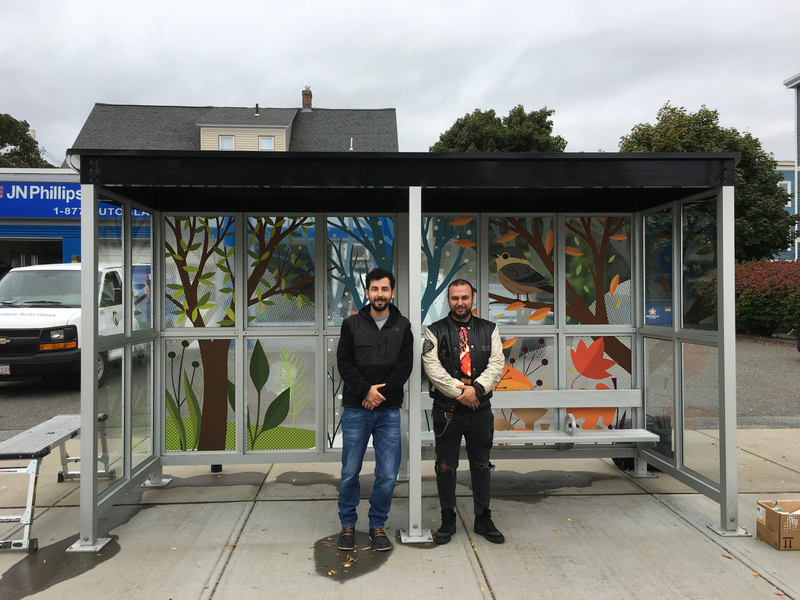 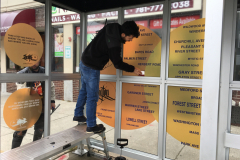 Together, the bus shelters celebrate the Town’s initiative to improve bus service so people can leave their cars at home. 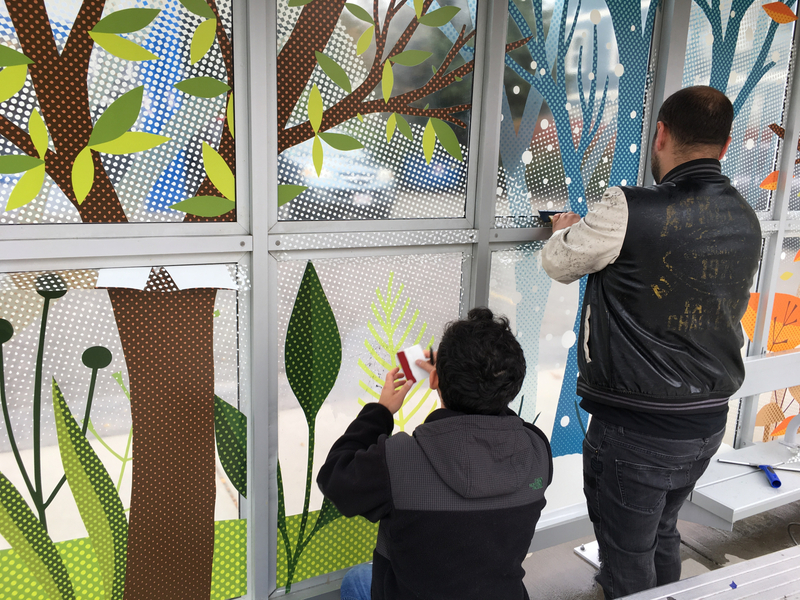 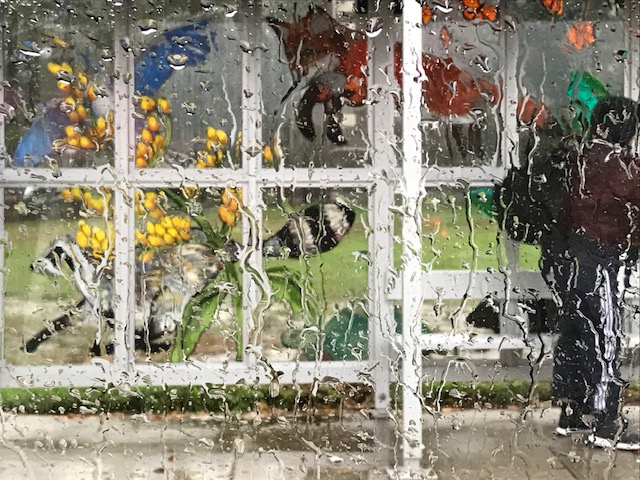 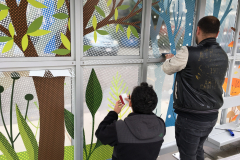 Shared themes include protecting the environment, connecting with neighbors, and enlivening the experience of waiting for the bus. 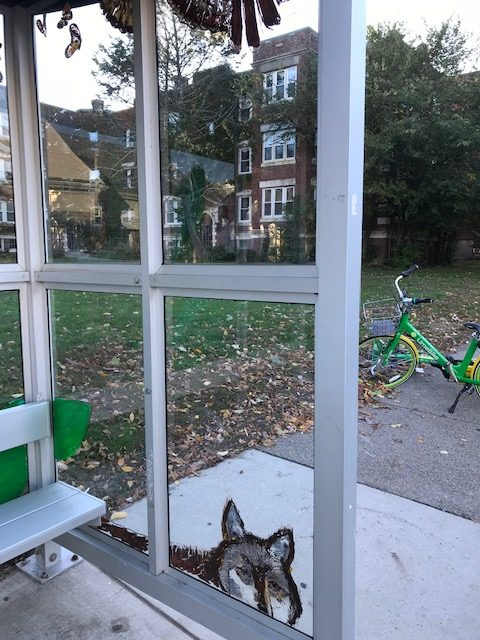 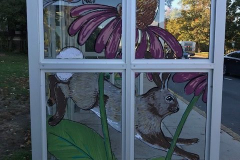 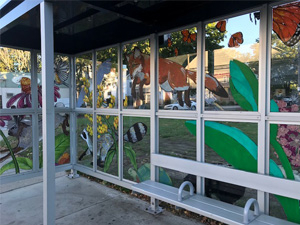 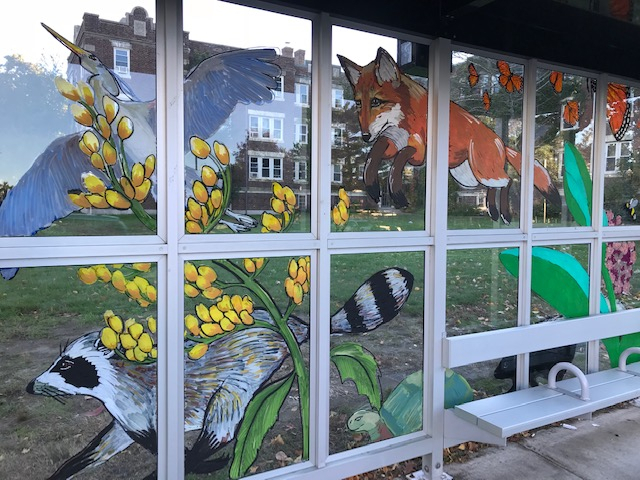 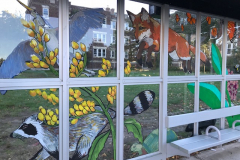 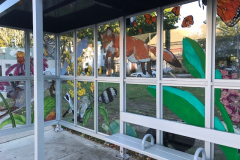 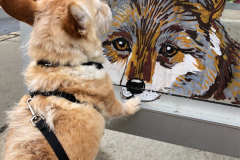 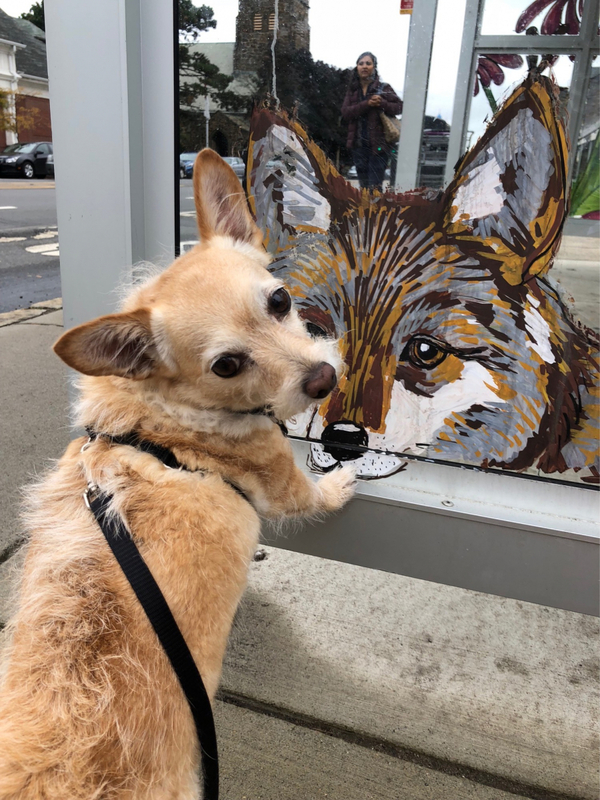 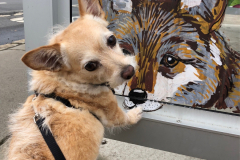 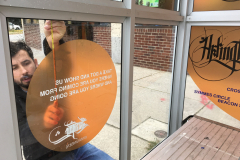 Arlington’s Eileen deRosas, a ceramic artist known for her paintings of animals on plates and pitchers, has covered her shelter with portraits of neighborhood wildlife: a coyote, skunk, rabbit, and turtle make their way across the glass, reminding us that taking the bus helps protect the environment. 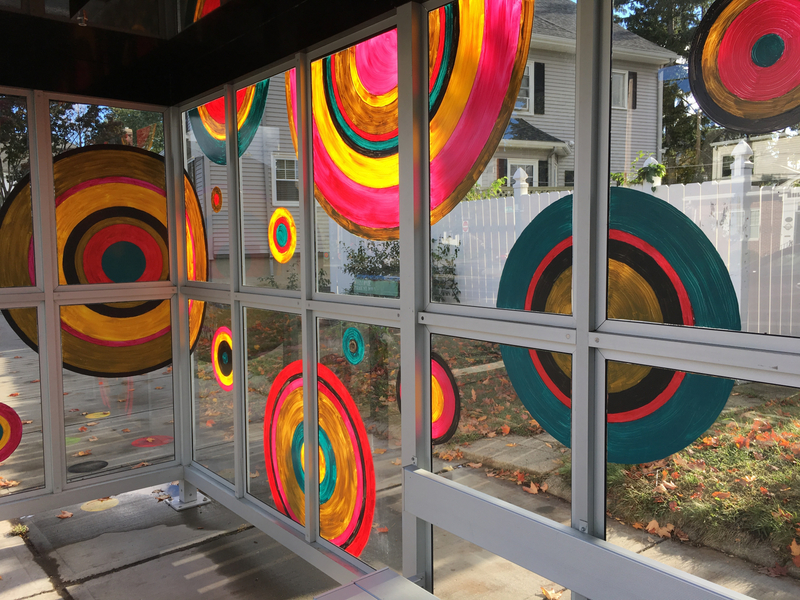 Johnny Lapham, also from Arlington, was invited to expand a project he did to transform the Arlington Service Station with polka dots. 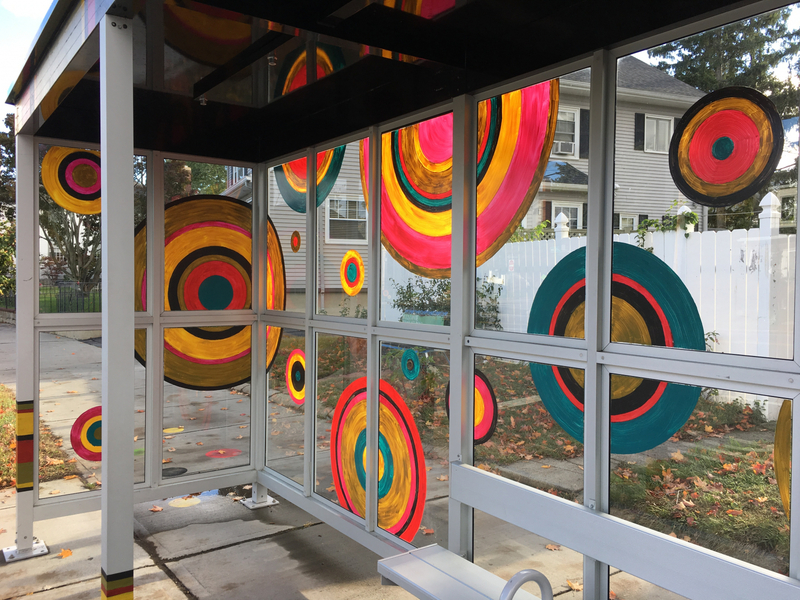 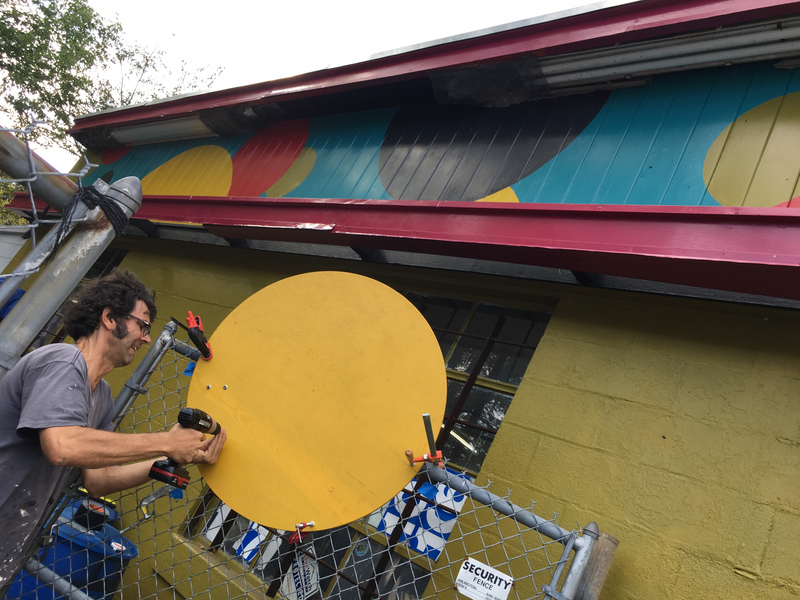 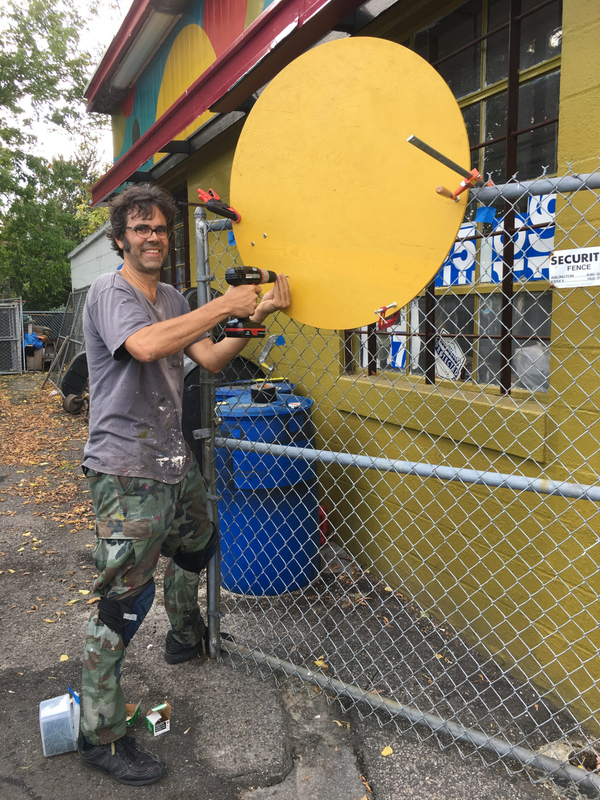 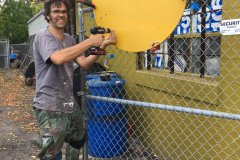 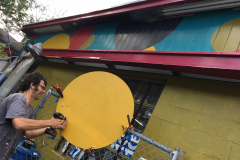 Using 80 painted plywood discs, he has created an impression that the polka dots have jumped off the gas station canopy, traveled down the sidewalk, and landed on the bus shelter like something in a Dr. Seuss story. 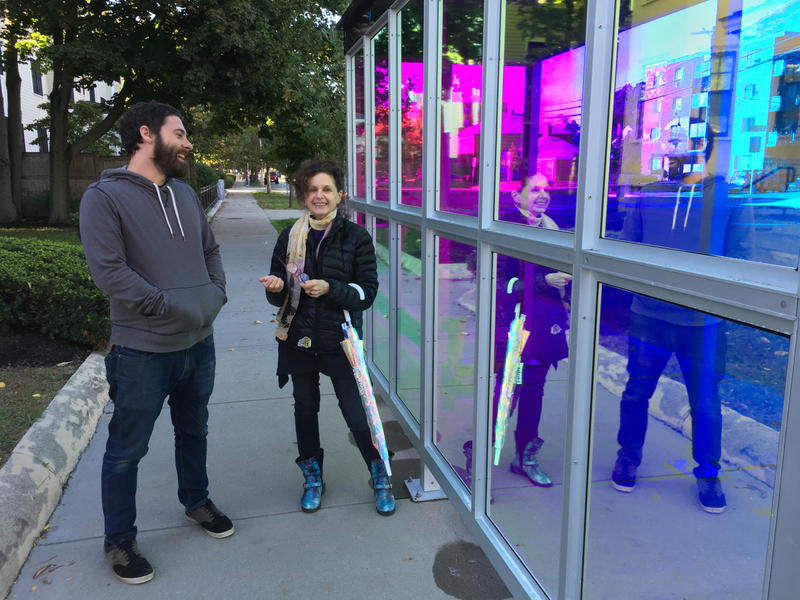 Two artists visiting from neighboring Somerville designed graphics that were printed on transparent film. 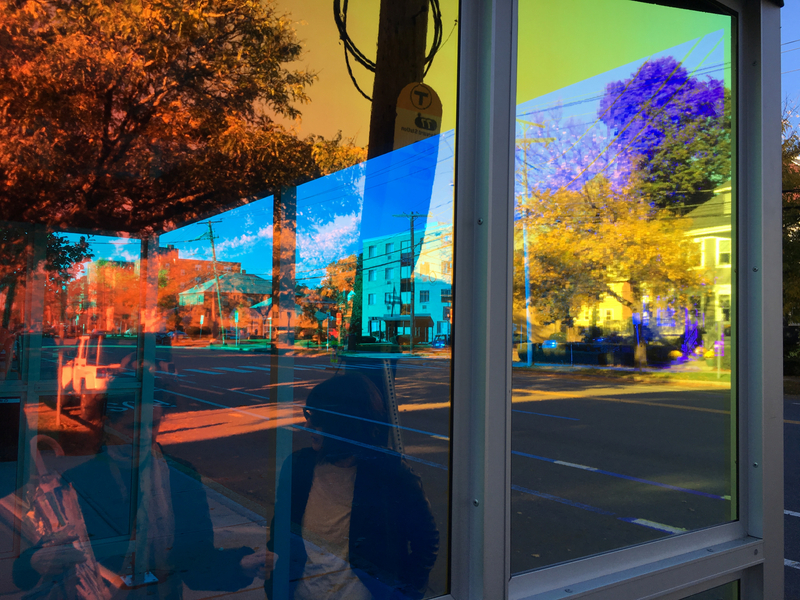 James Weinberg’s depiction of nature changing through the seasons features complex layered patterns and colors that glow when the sun comes through. 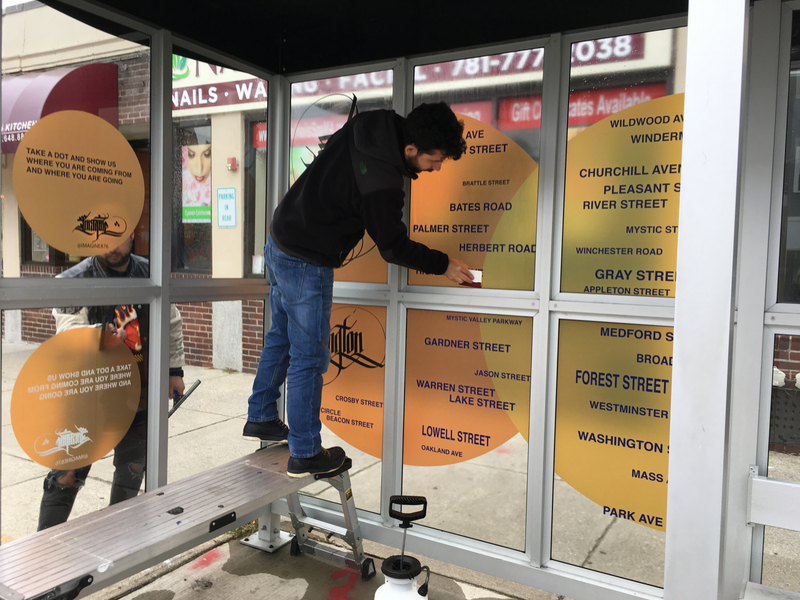 Sneha Shrestha, who goes by Imagine when painting her colorful street art murals, has placed the names of local streets inside two intersecting circles; people are invited to mark their destination or the street where they live with a dot. 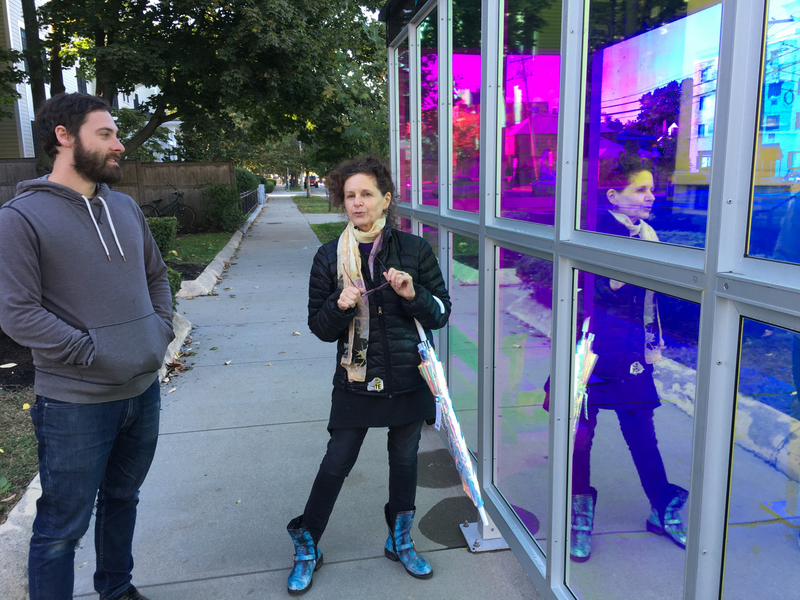 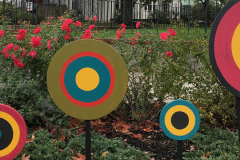 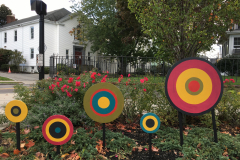 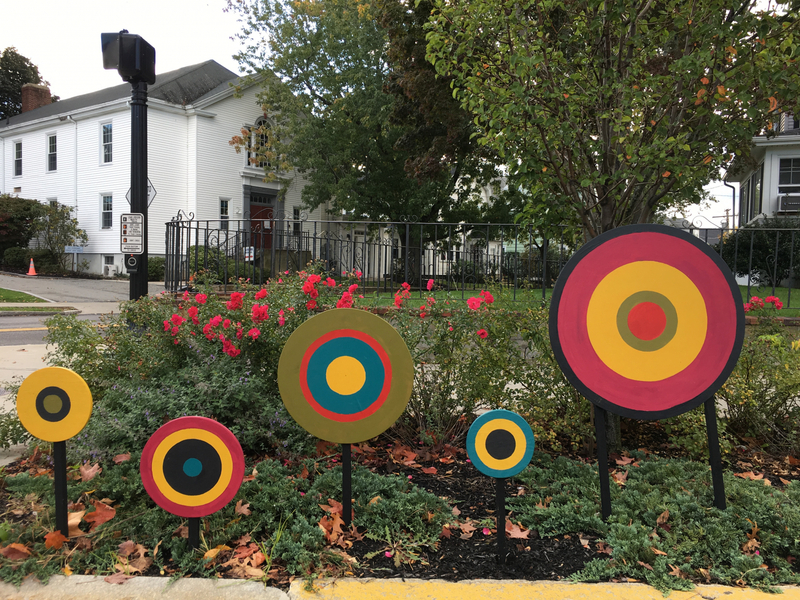 She hopes to prompt conversationbetween strangers, and envisions that the dots will add up to create a visual map of activity in Arlington. 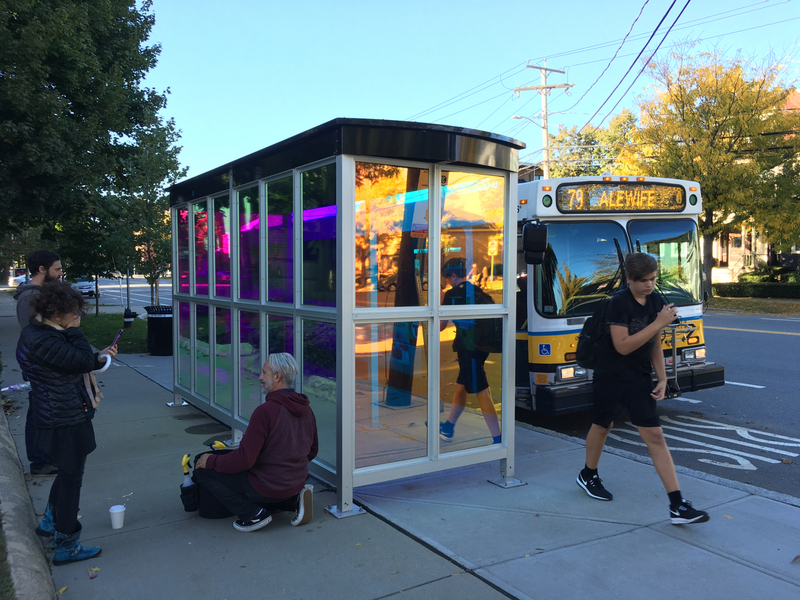 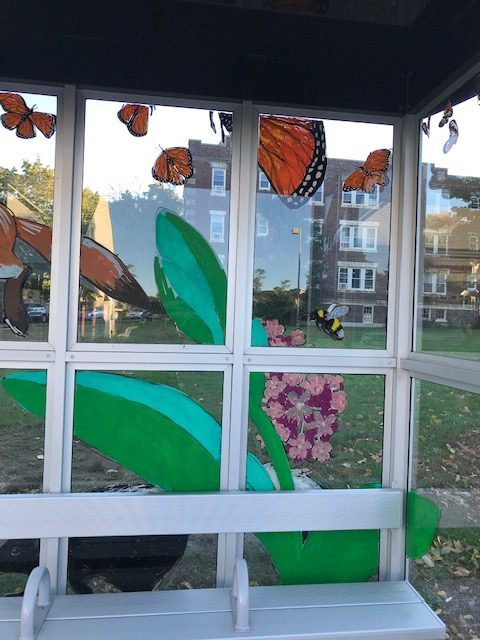 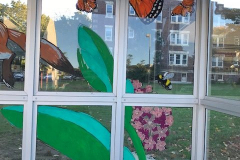 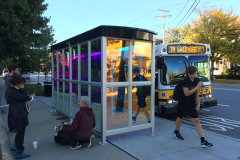 Boston artists Claudia Ravaschiere and Mike Moss brought their translucent Plexiglas butterflies to the Minuteman Bikeway last year. 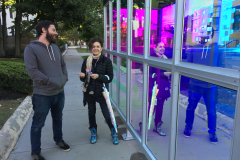 Continuing their interest in new materials and translucent effects they researched dichroic film and selected a version that transforms the light into unexpected and fugitive colors – blue, magenta, orange and purple – that are both transparent and reflective. 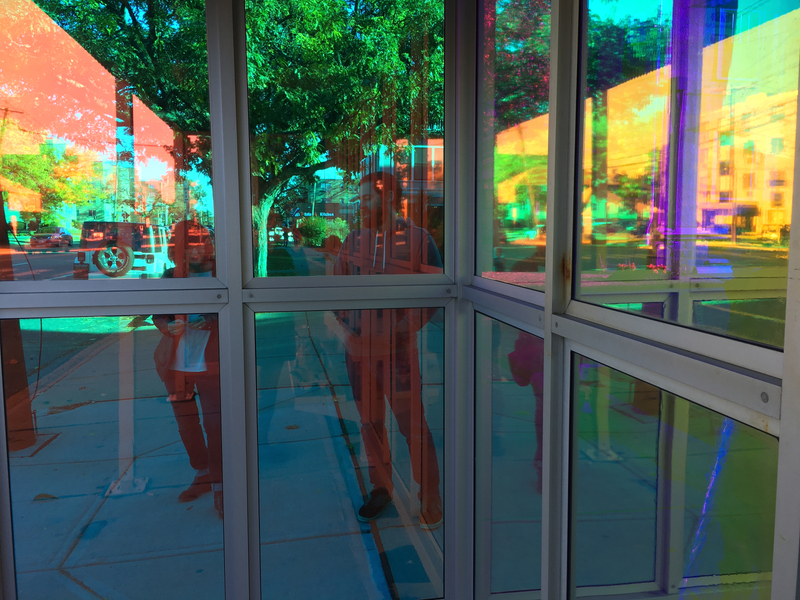 The colors shift with your movement; the effect is magical, as if you’ve stepped into a soap bubble. 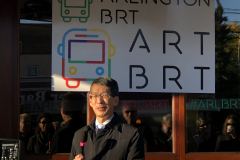 We invite you to take photos with your interpretation of the artwork and post with your comments to Facebook and Instagram with the hashtags #ARTBRT and #ARLBRT. 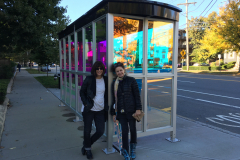 Let us know your favorites! 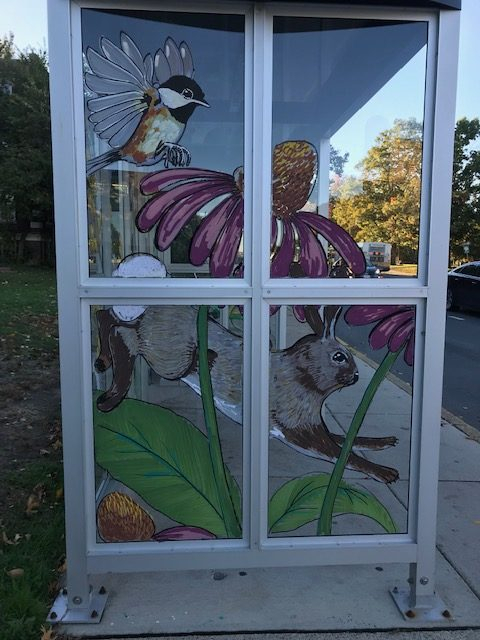 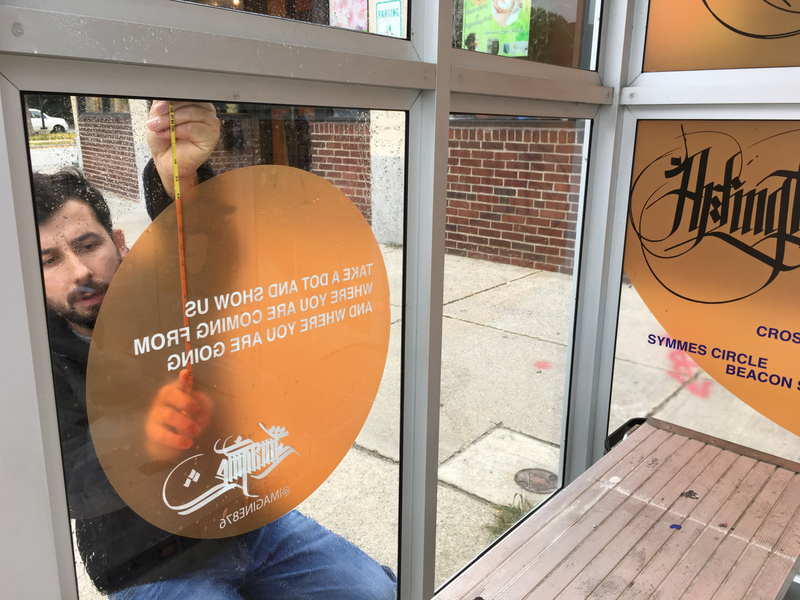 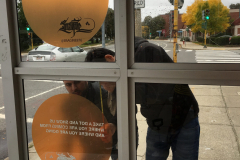 Look for more art to roll out along the Mass Ave corridor in October, including wheat paste animals by Eileen deRosas, a painted utility box by Johnny Lapham, and murals by James Weinberg and Imagine. 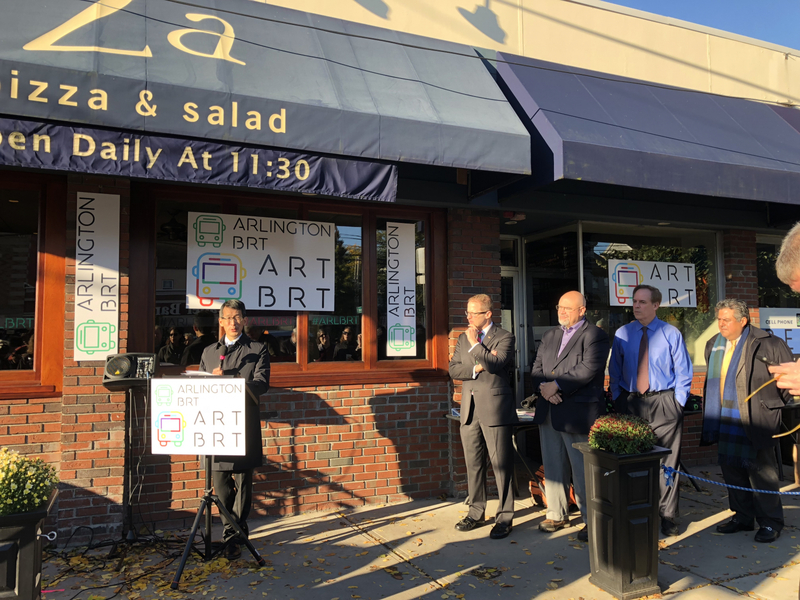 The project was curated by Cecily Miller, working in collaboration with Ali Carter, the Town’s Economic Development Coordinator, and funded by a generous grant from the Barr Foundation. 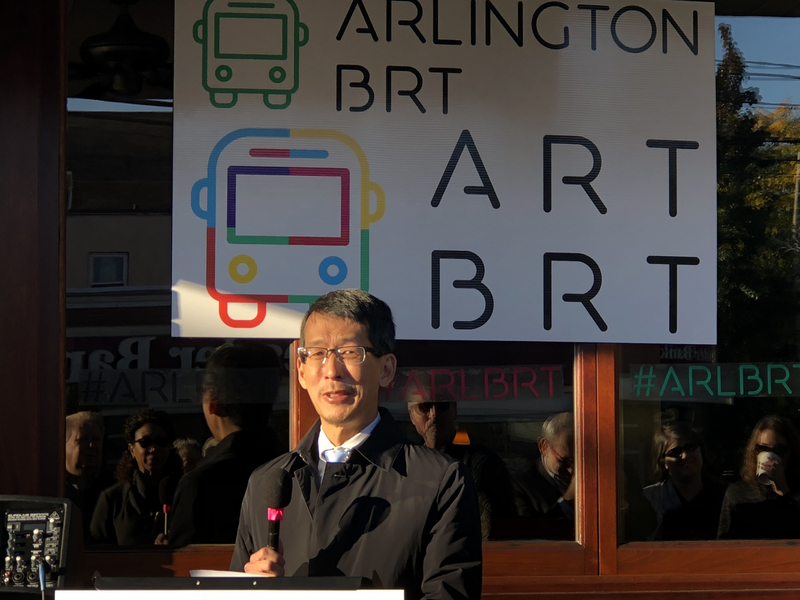 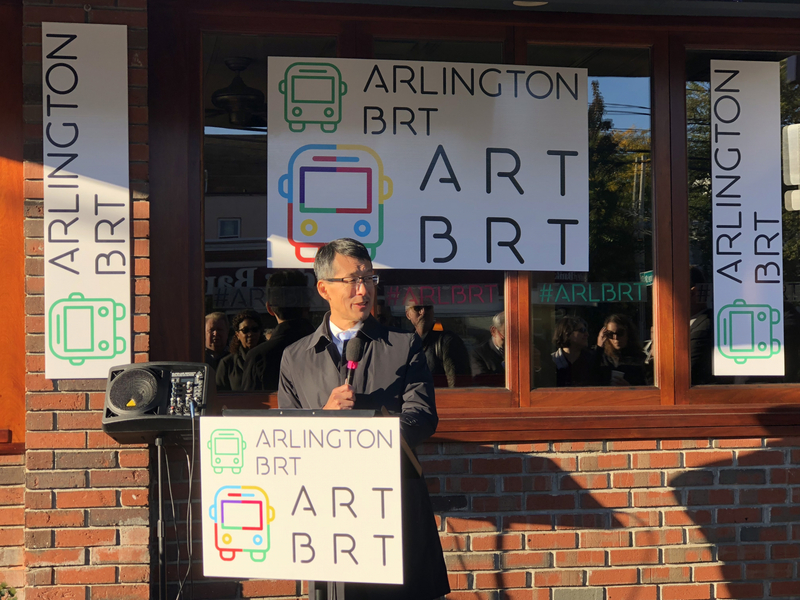 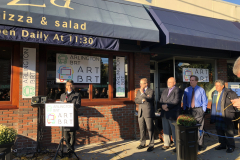 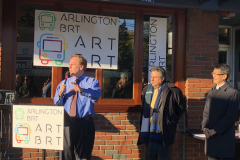 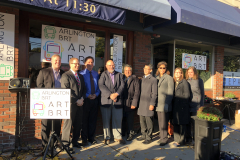 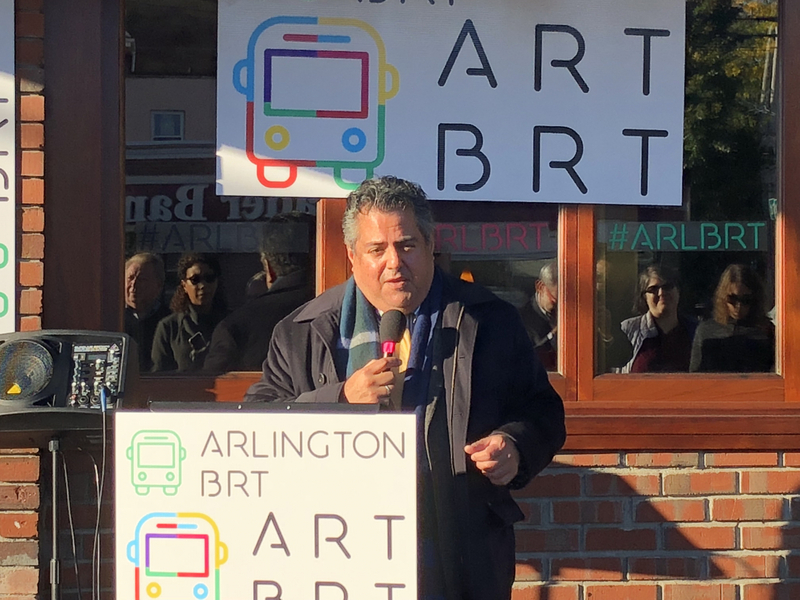 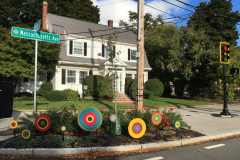 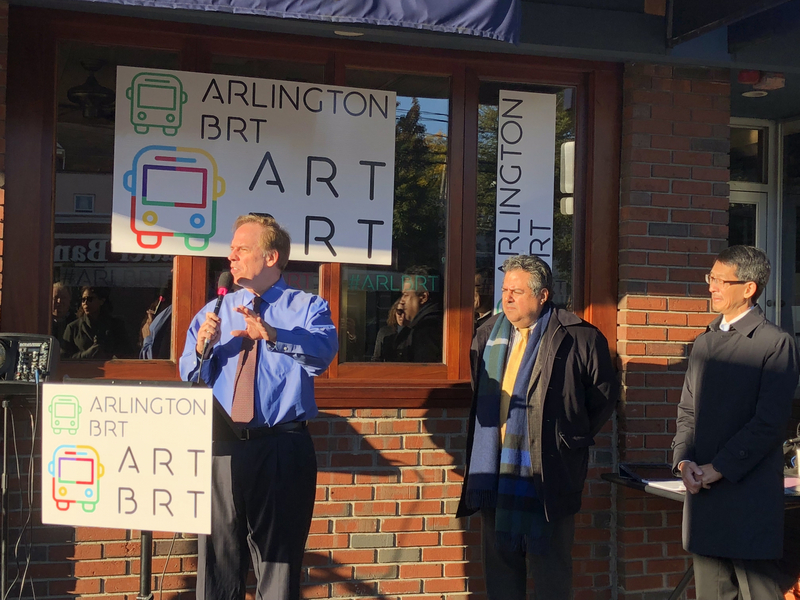 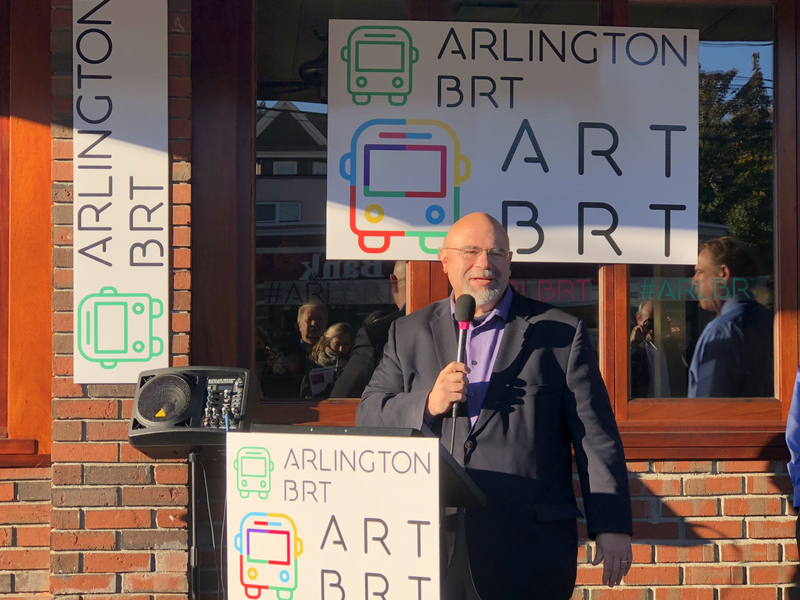 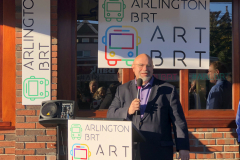 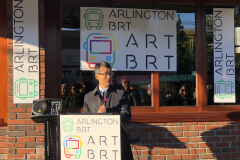 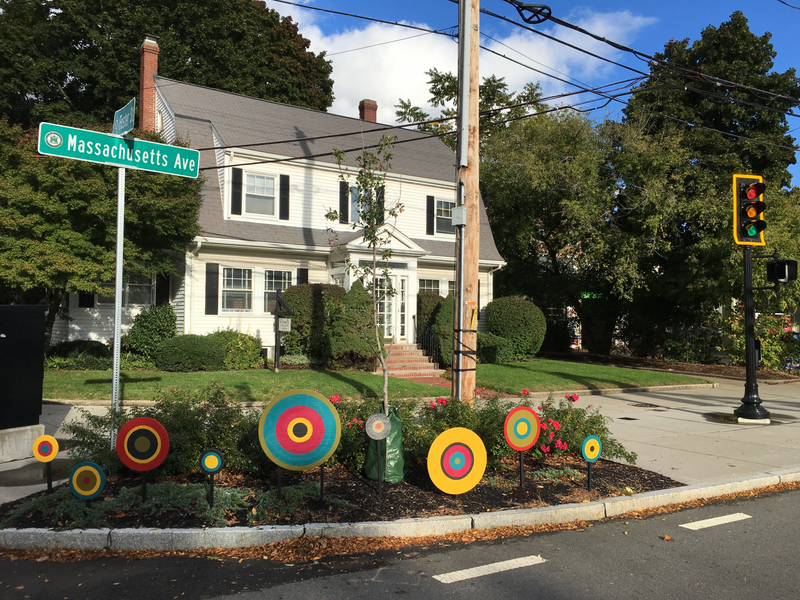 Arlington Public Art, now a committee of the Arlington Commission for Art and Culture, is grateful to the Town’s Planning and Community Development Department and its Director Jenny Raitt for this opportunity to integrate art into an important initiative in improving transportation infrastructure and service. 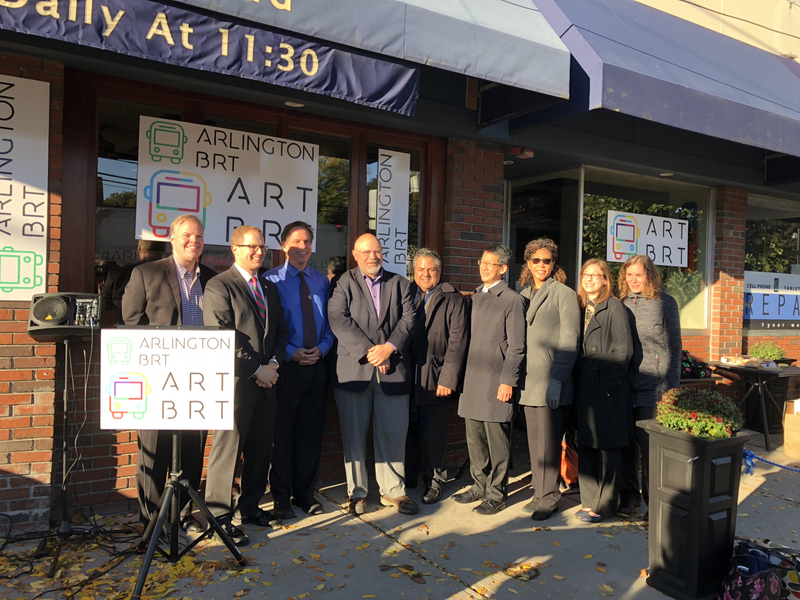 Our goal is to support the success of the BRT pilot and enhance the experience of thousands of bus riders! 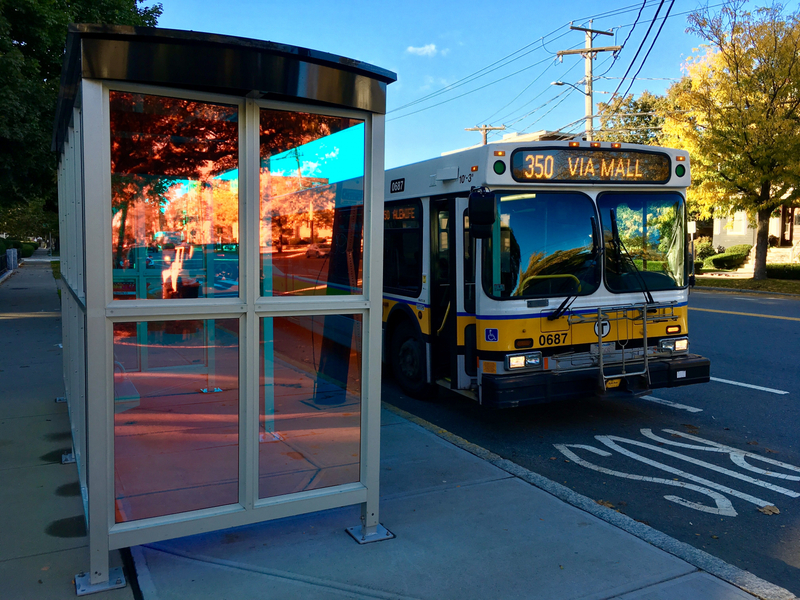 Serving the morning commute of MBTA buses, the BRT pilot will create a dedicated bus lane on Mass. 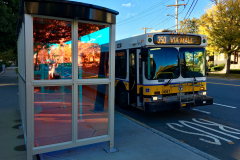 Avenue, eastbound, from Varnum Street to Alewife Brook Parkway, Monday through Friday, 6:00 a.m. to 9:00 a.m. for one month. 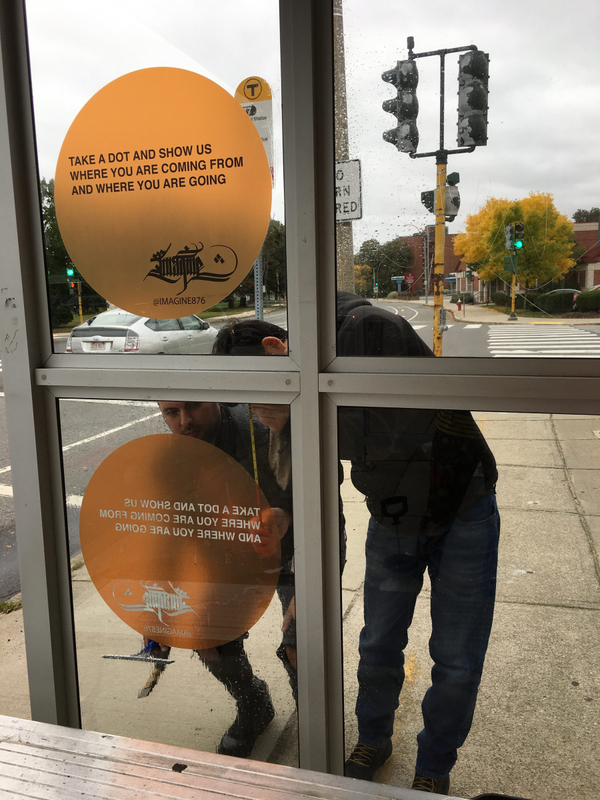 October 9th – November 9th. 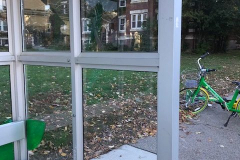 Funded by the Barr Foundation.